Skating has always been a foundational skill in the game of hockey. The game is faster than ever, however, the ability to use and control your edges provides the opportunity to create deception and confusion for your opponents. Combining that with unpredictable changes of direction, however so slightly, can give players the ability to get around defenders. 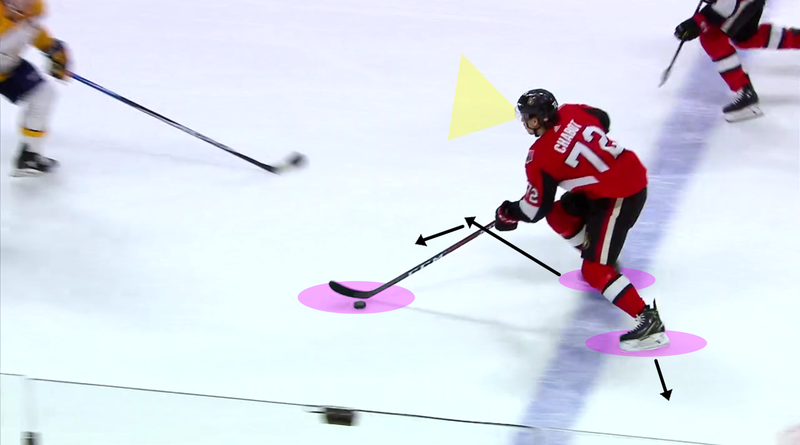 This is a skill that focuses more on the skating ability than shooting when looking for a scoring opportunity. The offensive player gives himself the space to get open before firing off a shot into the back of the net. 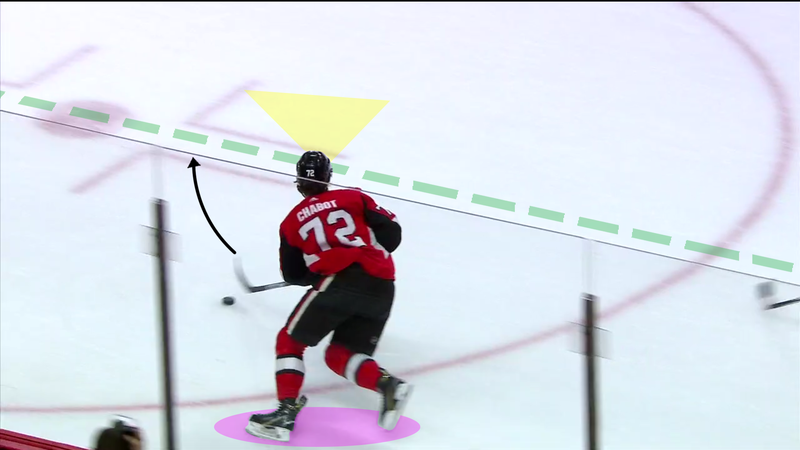 OTT72 enters the offensive zone with eyes up and with speed using powerful crossovers. 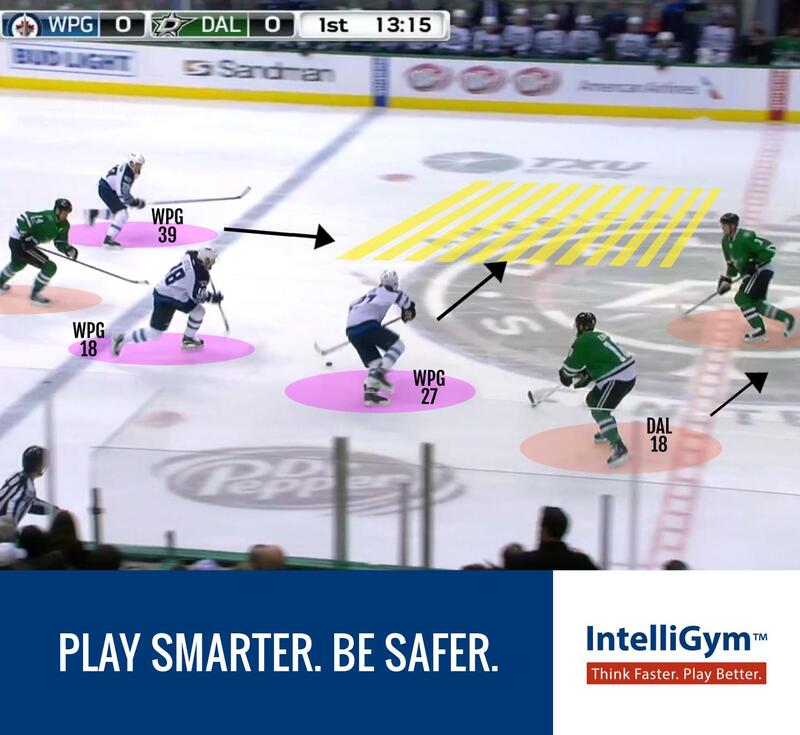 ‘Underhandling’ the puck is a key skill here with hands off the body and puck outside the skates. This allows for maximum speed and the ability to read pressure. OTT72 pushes hard with inside edge of outside (right) foot. 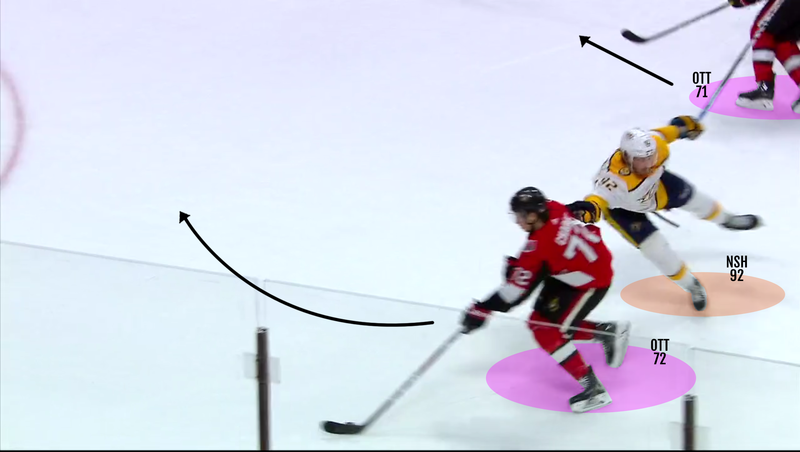 He pulls the puck across his body and shifts his weight from the inside edge of his outside (right) foot to the inside edge of his inside (left) foot. Eyes continue to be up and reading the play. 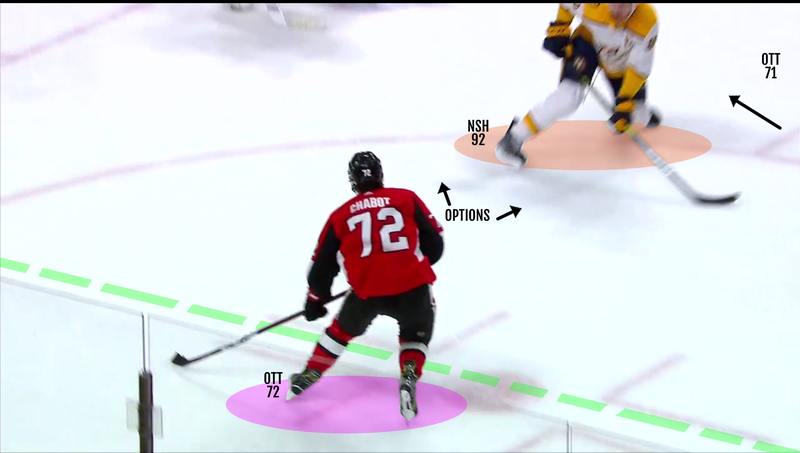 OTT72 shifts weight back from inside foot to outside foot and pulls puck back across and outside skates. 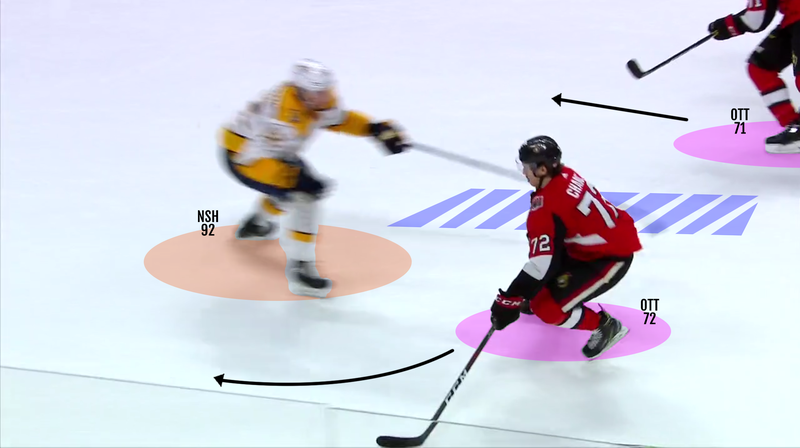 NSH92 reads the pass to OTT71 and has stick in passing lane, however, he is moving forward and his toes are pointed towards OTT71. 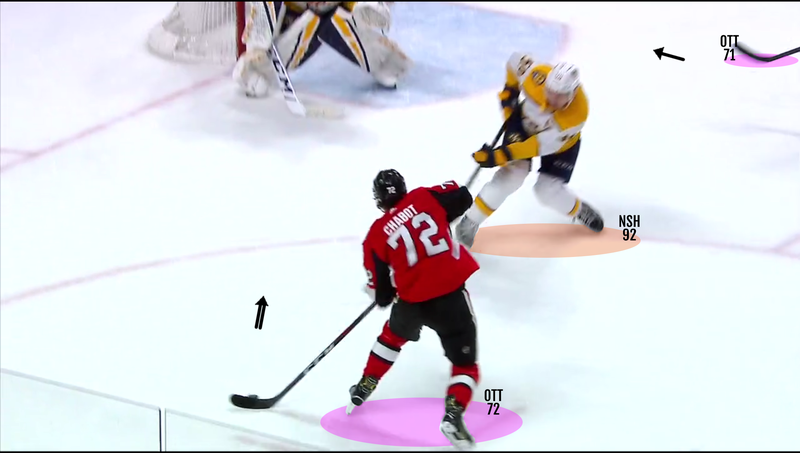 OTT72 reads the feet of NSH92 and pushes hard off inside edge of inside (left) foot. This creates indecision in NSH59 who is looking to take away the pass as he pushes away from OTT72. NSH59 tries to hurry the shot but is too far away to get his body or stick in the shooting lane. 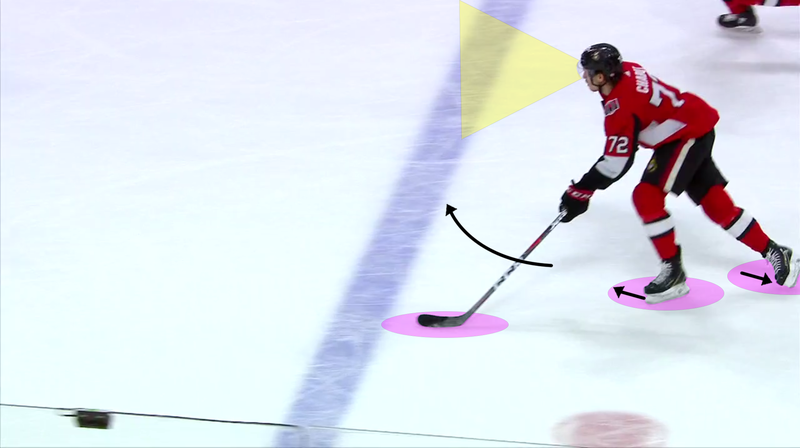 Watch the video clip again to see how the ability to roll on your edges is a game changing skill that allows players to play with speed and agility to create deception and confusion.